It's beginning to seem as if Pixar's delivery of one of the very best films of the year will be an unstoppable annual tradition. 96 min. Walt Disney Pictures. Director: Pete Docter. Cast: Ed Asner, Christopher Plummer. Don't get me wrong: Up makes for a thoroughly entertaining ninety-six minutes. But what "elevates" the movie beyond the usual climes of animated adventure is one four-minute passage that economically presents sixty years of exposition for the film's leading character, Carl Fredricksen, and his wife Ellie. The wordless montage demonstrates a lesson learned by Pixar Animation Studios on their Toy Story 2, which memorably featured a musical montage poignantly set to the song "When Somebody Loved Me." Played out in expressive animated mime and set to Michael Giacchino's lovely, lilting score, Up's "Married Life" montage traces a loving couple's ups and downs,and illustrates that old adage popularized by John Lennon: "Life is what happens to you while you're busy making other plans." The story proper "takes off" from there, as a now-elderly and widowed Carl (Ed Asner) escapes from his dismal reality by lashing thousands of balloons to the house he and Ellie built and shared. In doing so, he means to achieve their lifelong dream to follow in the footsteps of great explorer Charles Muntz (Christopher Plummer), who lived out his catchphrase "Adventure is out there!" by disappearing into the wilds of the remote Venezuelan landmark Paradise Falls, "a land lost in time." Carl's flying house echoes his and Ellie's childhood enthusiasm for Muntz's dirigible, the Spirit of Adventure. (Muntz's backstory is established in another montage, this one a Citizen Kane-style, fake, black-and-white newsreel.) Added trouble appears in the form of chipper Wilderness Explorer Russell (Jordan Nagai), whose determination to achieve his Assisting the Elderly badge has returned him to Carl's porch—after the old man sent the boy on a snipe hunt. At Paradise Falls, the mythical becomes reality, as the old man and the boy discover what might as well be a snipe (a thirteen-foot-tall flightless bird named Kevin) and the man hunting it: none other than Charles Muntz. Muntz has become something of a Dr. Moreau, a crazed recluse intent on proving the existence of the bird and thus rehabilitating his image after making unverifiable claims decades earlier. His mad scientist energy went into training a fleet of dogs and equipping them with thought-translating voice collars. Thus Carl and Russell come to meet Dug (writer/co-director Bob Peterson), a happily stupid dog eager to replace his indentured servitude with affectionate friendship. Whether they know it or not, this is a driving impulse for Carl (whose mission is something of a fool's errand) and Russell (whose parents' separation has left him confused and lonely). Carl's overriding instinct is to cling to Ellie—the ghost in the house; burdened by his accumulated possessions, Carl's heroic moment comes when he recognizes the greater importance of the moment and the people with whom he shares it, and thus unburdens himself. In this, Up echoes the anti-materialism of WALL•e: for such a successful commercial entity, Pixar remains staunchly skeptical of our cluttered society. 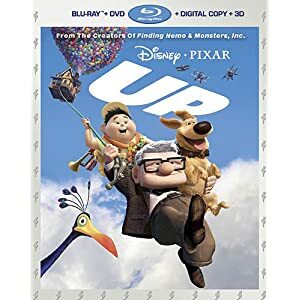 Up is nothing if not impeccably produced—by Jonas Rivera and executive producers John Lasseter and Andrew Stanton—and directed—by Pete Docter, who prevously helmed Monsters, Inc. The elegant design, colorful animation, and sharp storytelling (abetted by actor and indie director Tom McCarthy) combine for yet another Pixar winner that works like gangbusters for kids and speaks to adults. The comedy works for all ages, and movie buffs will enjoy the nostalgic touches, including a protagonist clearly modeled on Spencer Tracy and an antagonist who's a dead ringer for Kirk Douglas. It's beginning to seem as if Pixar's delivery of one of the very best films of the year will be an unstoppable annual tradition. 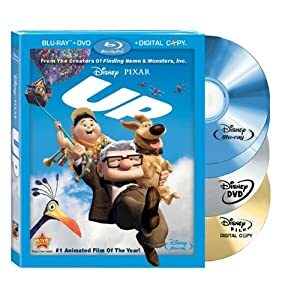 It's another state-of-the-art home-video release for Pixar with their Blu-ray 3D + Blu-ray + DVD + Digital Copy combo-pack for Up. The five-disc set features a stunningly sharp and vibrant hi-def transfer now rendered in 3D as well as full 1080p resolution (on the Blu-rays) and standard-def (on the DVD). A third Blu-ray disc contains additional bonus features (some of them exclusive to the Blu-ray combo packs), while the fifth disc houses the Digital Copy designed for mobile or home-computer use. There can be no complaints about the perfectly calibrated image, which appears to lose not a whit from its source. The 3D version masterfully recreates the theatrical 3D experience with a technically top-of-the-line encoding that honors every bit of the 3D design (with nothing to worry about in the area of crosstalk); there's also no loss of sharpness or brightness or color vibrancy from the equally impeccable, though less "dimensional" 2D HD transfer. This is more of a "lively" 3D presentation than a "showy" one, but that's in keeping with Pixar's artful approach to storytelling. The lossless DTS-HD Master Audio 5.1 mix truly deserves the designation "Master Audio" with its thrilling fullness and constant use of directional effects, especially in the jungle and air sequences. 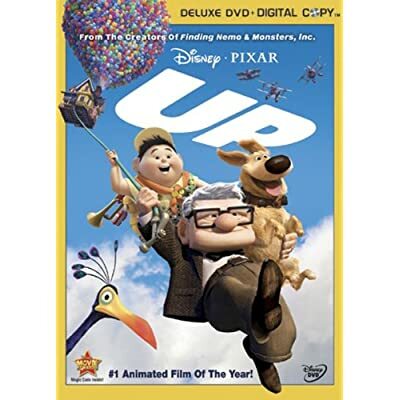 Up is most definitely reference-quality material with which to show off your home theater. All of the bonus features are presented in full HD, including Disney's now-customary Cine-Explore video commentary, this one featuring writer/director Pete Docter and writer/co-director Bob Peterson telling us everything we wanted to know about the making of Up. Next up is the terrific theatrical short (about baby-delivering storks) that accompanied Up in theaters: "Partly Cloudy" (5:46, HD). We also get the all-new original short "Dug's Special Mission" (4:40, HD), starring everyone's favorite talking dog. "Adventure is Out There" (22:17, HD) is a revealing look at the research scouting mission to Venezuela, undertaken by a group of Pixar staffers. The featurette features tons of video from the trip as well as interviews with Docter, Peterson, tepui naturalist/filmmaker Adrian Warren, production manager Mark Nielsen, story supervisor Ronnie Del Carmen, art director Bryn Imagire, environment art director Nat McLaughlin, production designer Ricky Nierva, supervising technical director Steve May, art director Don Shank, lighting direction Lou Romano, and producer Jonas Rivera. "Alternate Scene: The Many Endings of Muntz" (4:56, HD) explores the evolution of the film's climax with Docter, Del Carmen, Rivera, May, and Peterson. Disc Two houses Blu-ray exclusives, starting with seven excellent documentary featurettes: "Geriatric Hero" (6:24, HD), "Canine Companions" (8:26, HD), "Russell: Wilderness Explorer" (9:00, HD), b(5:04, HD), "Homemakers of Pixar" (4:35, HD), "Balloons and Flight" (6:25, HD), and "Composing for Characters" (7:37, HD). The featurettes explore the development of the characters, the design of the house and the Spirit of Adventure, the research behind the animation, and the film's score. Interviewees include Docter, supervising animator Scott Clark, Peterson, Rivera, Nierva, Del Carmen, directing animator Dave Mullins, directing animator Shawn Krause, character supervisor Thomas Jordan, dog behaviorist Ian Dunbar, directing animator Mike Venturini, character modeling & articulation lead Tom Sanocki, simulation & crowds artist Paul Kanyuk, story artist Peter Sohn, character art direction Daniel Lopez Muñoz, writer Tom McCarthy, character cloth lead Claudia Chung, animator Dan Nguyen, Jordan Nagai (at the mic), art director Albert Lozano, simulation & crowds artist Edwin Chang, sound designer Tom Myers, character shading & grooming artist Laura Hainke, Imagire, characetr shading & grooming artist Byron Bashforth, art director Don Shank, sets modeling artist Suzanne Slatcher, director of photography - lighting Jean-Claude Kalache, director of photography - camera Patrick Lin, and Michael Giacchino. "Alternate Scene: Married Life" (9:13, HD) has Docter, Peterson, Nierva, and Del Carmen present a variation on the film's now-famous montage. "Up Promo Montage" (6:00, HD) is a collection of original gag sequences used in the film's promotion. Global Guardian Badge Game (HD) is an educational, global trivia challenge, presented Russell-style. Worldwide Trailers include "Theatrical Trailer #2" (1:48, HD) and "Theatrical Trailer #3" (2:29, HD). And naturally, the set is BD-Live enabled for additional online content. This is a keeper, folks, one to put "Up" on the top shelf. All site content © 2000-2019 Peter Canavese. Page generated at 04/21/2019 01:24:47AM.